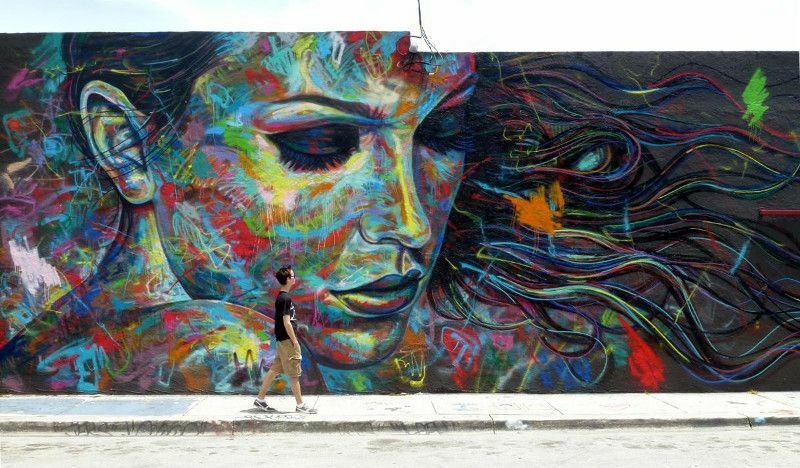 Hailing from London, David Walker is a highly-talented artist whose career has been on a steady rise since he began exhibiting his work. 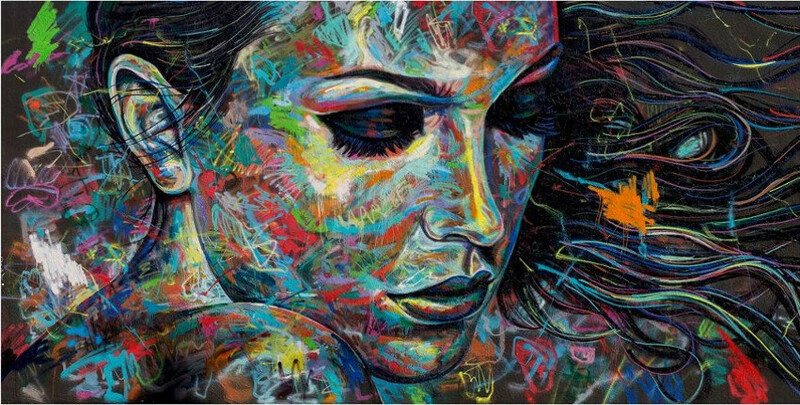 The English artist has created an inimitable style of amazing, color-explosive and chaotic female character portraits using only spray cans without any aid of stencils or brushes. His outstanding wall pieces and studio works are often blended through as colors drip or mix. The artist has developed his style gradually – he started his journey as a fan of graphic black-and-white technique which later evolved into Walker’s unique style characterized by a full range of vivid colors. Speaking about the process of creation, Walker has said that he usually lets the colors guide his mind and hands, leaving everything to chance. Creating portraits without stencils has helped him develop his trademark multi-layered style. The numerous abstract areas and infinite colorful lines are intertwined with patches of clashing colors, disappearing letterforms and see-through drips, which only increases the beauty of dramatic effect. Walker’s style fuses both sophisticated and dumb mark making. 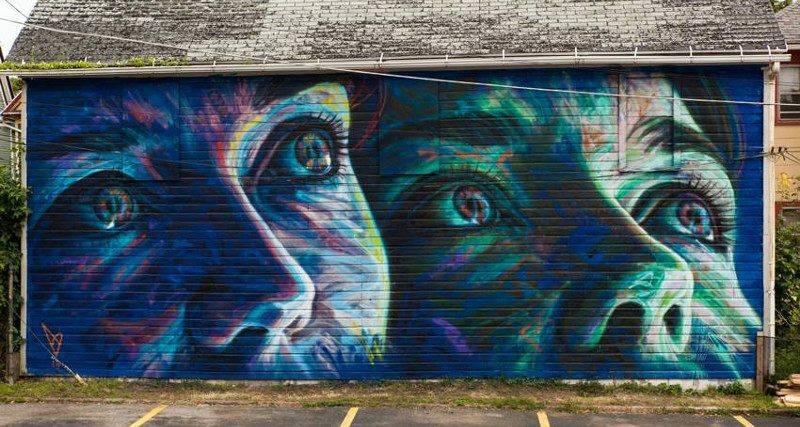 The outcome is impressive: visually rich portraits that incorporate graffiti, photorealism, and abstraction, all expressed through the strength that comes from the medium. Layered with color, motion, and emotion, Walker’s portraits usually depict both strong and fragile female characters. These wonderful portraits, which are created either outdoors on large walls or in the artist’s studio, are based on his own photographs. When he first decided to paint women, he used the pictures from the Internet and magazines. 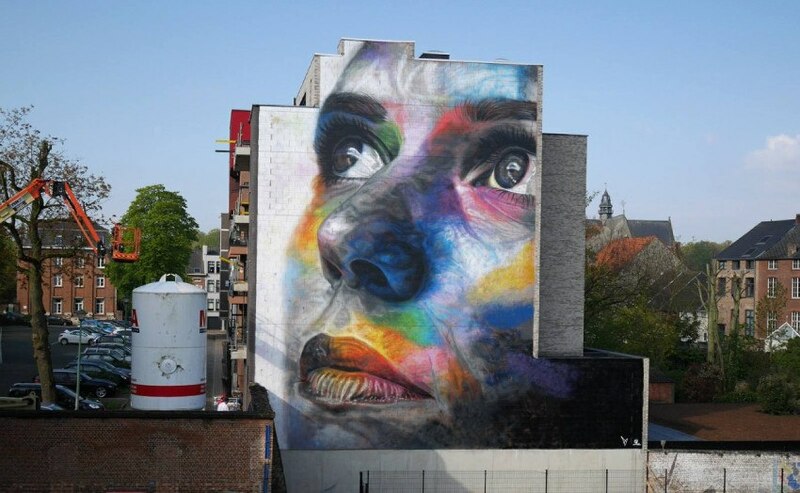 Nowadays, however, he says that it is more unconscious – it is enough for him to see a face to be inspired and transfer his vision onto a wall or canvas. Initially, David only worked with black, white, and pink colors, since they were much cheaper. This also allowed him to concentrate on the subjects, as opposed to the colors. One day, he found a box of unused spray paints with a variety of colors in his studio. He attempted to experiment and found it useful to display all the colors at once. Walker has a high level of skills as he is very detail-orientated and possesses an excellent level of control to produce shadows, lines, and textures in his artwork. Drawn by the idea of creating beautiful out of low-brow materials and methods, Walker enjoys bringing attention to the street art world by painting with only spray paint. His lack of brushwork raises questions when comparing graffiti and traditional paintings. Since he started working on the street he has built a very strong fan base worldwide. 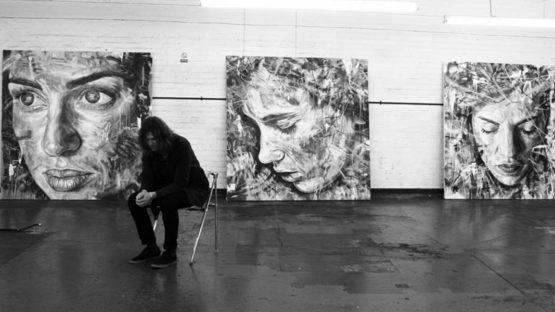 Some of the locations that he has painted include New York, LA, Hong Kong, Bali, Lisbon, Berlin and many others. One of his favorite locations to visit is Berlin since he loves the beautiful sight, great weather, delicious food, and amazing people. Most people’s first job involved burgers and fries, but David Walker’s first job was creating t-shirt designs for The Prodigy, an English electronic dance music group. His cousin was the band’s manager and she told him that the band was looking for some ideas, which he submitted. Watching the band grow and becoming worldwide popular served him as yet another inspiration for his work. This was also the great starting point of his career, which led to a variety of designs and eventually his own street wear label Subsurface. The artist has exhibited his works all over Europe and the US. He has had numerous solo and group exhibitions and has taken part in many festivals as well. Since his beginnings in 2004, his works were included in many group exhibitions, most important being the one in 2010, where he displayed a large-scale painting installation with Mutate Britain at the Glastonbury Unfairground. The 2011 exhibition Bridges of Fire was Walker’s first major one-person show, organized by the Rook and Raven. The title derived from an Antony and the Johnsons song, which he said perfectly matched and described the portraits of women he had created. For a long time, the artist has been a member of the Scrawl Collective. This group was founded by some of the most prominent artists, such as Will Barras, Mr. Jago, and Nick Walker, among many. Today, Walker works on a variety of high-quality silkscreen prints that can be found in his shop online. He has remained faithful to the spray can from when he started in order to fully explore the potentials of sprays and push the limits of this medium. His use of vibrant, clashing colors with translucent drips, “a beautiful mess” as he likes to call it, is arresting to even the least interested of passers-by and pedestrians. Walker is represented by Galerie Mathgoth in Paris, Robert Fontaine in Miami and Hang-Up Gallery in London. 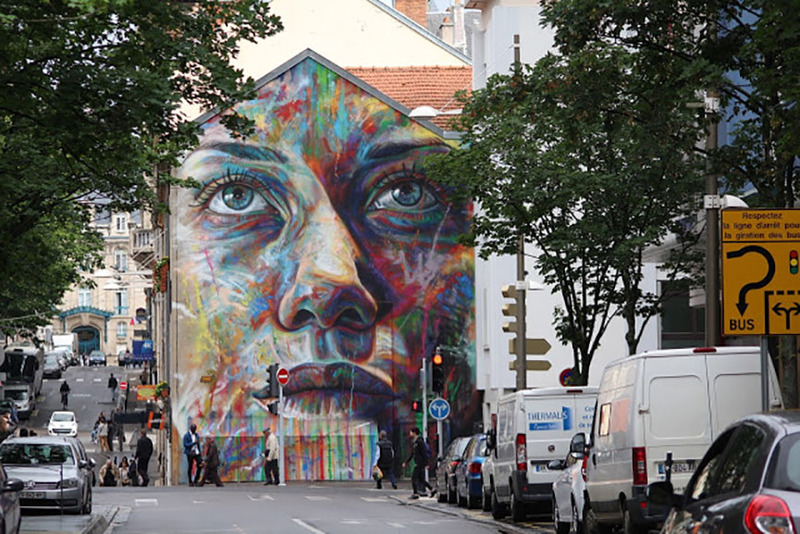 David Walker currently lives and works in Berlin.